Before this dessert went totally buried from others that keep streaming out from the oven, I better share it with you now. 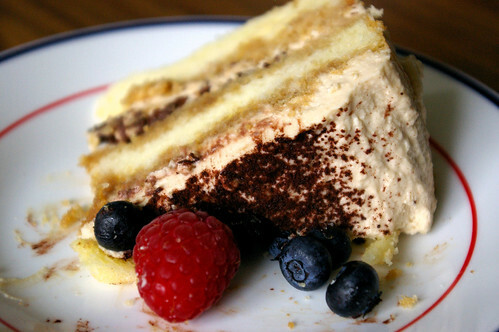 It is in a way similar to the Tiramisu I made not long ago, but alcohol free. And with an extra dose of caffeine thrown into the cake. 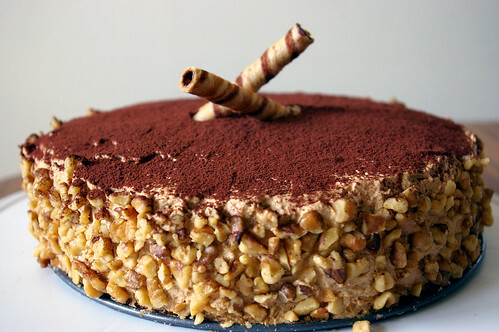 I first saw the recipe of Coffee Walnut Cake with Coffee Mascarpone Cream in Jan 2007 issue of Bon Appetite magazine, and had bookmarked it since I know I would love this cake, simply judging from the list of its ingredients. After holding the recipe on for so long, I am happy to report that my intuition was right.The reason that it wasn't made immediately was because of the lack of photograph on the magazine ( yes, I am a visual person) and several negative comments left on its website, which kept my enthusiasm at bay. Also I must confess that I was lured into making other desserts, mostly ones with stunning pictures that whet my appetite. 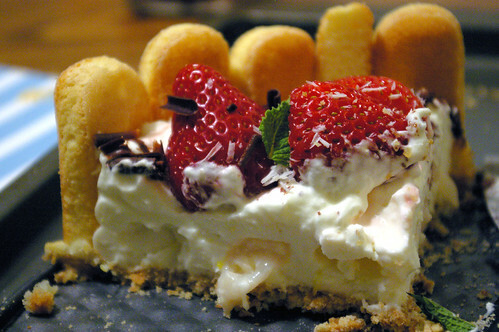 Anyhow, I finally pluck up enough courage to make this cake after a recent success with its alcoholic cousin - Tiramisu. Both cakes are very similar in ingredients and preparations, so I guess it couldn't be as bad as other reviewers had rated. 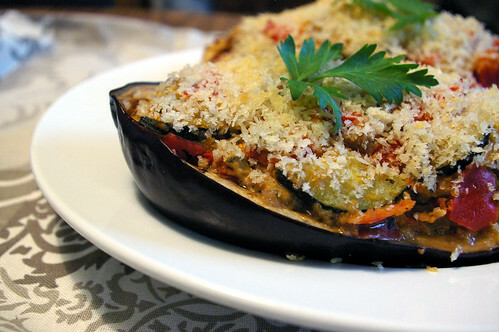 Moreover, It's Dorie Greenspan's recipe. Having tried a few recipes with great success from her amazing book- Baking From My Home to Yours, I feel pretty positive about baking this cake. Truth be told, I have one tub of Mascarpone cheese waiting to be used before it get expires in the imminent future. So, with a sense of urgency, I started making the cake. 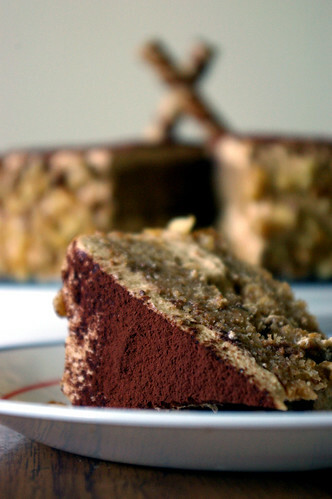 True to its name, this cake is full of walnut flavor. Part of the toasted walnut was grounded and added into the cake batter. A tablespoon of instant espresso powder is also added to the batter to impart a coffee flavor. As a result, I got a tender, fine crumb, nutty cake with great coffee aroma. After making the coffee mascarpone cream, which is a coffee lover dream come true,I decided to add some finely chopped 72% chocolate on top of the cream. A trick that I learned from the Tiramisu which I believe will taste nice here too. And it did! 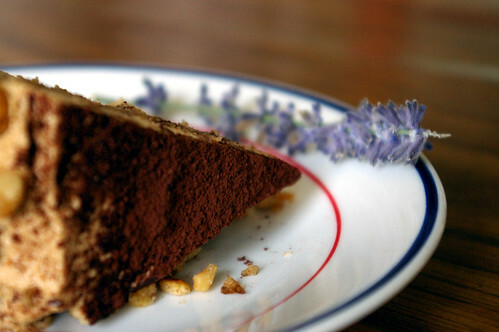 After frosting the cake, I cut a generous slice for myself and enjoyed it over a cup of coffee in the afternoon. The rest was passed to OCT's lab for the Friday lab meeting. Although this is the kind of cake OCT and I like, I believe it may not be something that kids would enjoy. Neither would people who don't drink coffee nor dislike walnut. But if I ever ran a cafe one day, this will surely be on the menu! hey, I am allowed to dream right? Position rack in center of oven and preheat to 350°F. Butter and flour two 9-inch-diameter cake pans with 1 1/2-inch-high sides. Blend 1/2 cup walnuts, 1 tablespoon sugar, and espresso in processor until nuts are finely ground. Whisk flour, baking powder, cinnamon, baking soda, and salt in medium bowl to blend. Using electric mixer, beat butter in large bowl until smooth. Gradually add remaining sugar (1 cup minus 1 tablespoon), beating until fluffy. Beat in eggs, 1 at a time, then egg yolk. Add ground walnut mixture and vanilla; beat to blend. Reduce mixer speed to low and beat in dry ingredients in 3 additions alternately with buttermilk in 2 additions. Fold in remaining 1/2 cup walnuts. Divide batter evenly between prepared pans. Bake cake layers until tester inserted into center comes out clean, about 26 minutes. Cool in pans 5 minutes, then turn out onto racks and cool completely. Stir espresso and 1 tablespoon water in large bowl until coffee dissolves. Add cream, mascarpone, sugar, and vanilla. Beat until filling is thick and smooth (do not overbeat or filling may curdle). Place 1 cake layer on platter, flat side up. Spread half of filling over cake. Sprinkle the chopped chocolate on top of filling. Place second layer, flat side down, on filling. Spread remaining filling over top. Mix walnuts, cinnamon, and salt. Sprinkle over top of cake. Cover with cake dome. Chill at least 1 hour and up to 1 day. It's no secret that cheesecake is one of my favorite desserts. In fact, I love cheesecake so much that I dedicated one corner of my fridge as the permanent spot for blocks of cream cheese. I just have to have cream cheese at home at all time! It gives me "sense of security" and "empowerment", knowing that I can whip up a cheesecake whenever I feel like eating one. Summer however, gives the cheesecake monster in me a hard time. Mostly because I am avoiding having any dealing with the oven. There's the option of buying store-bought cheesecake, but that would make me feel like betraying the dozen blocks of cream cheese I already have. 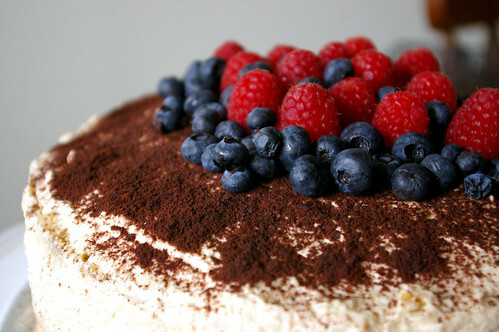 My dilemma came to end, when I saw an impressive no-bake version from Ellena's blog. 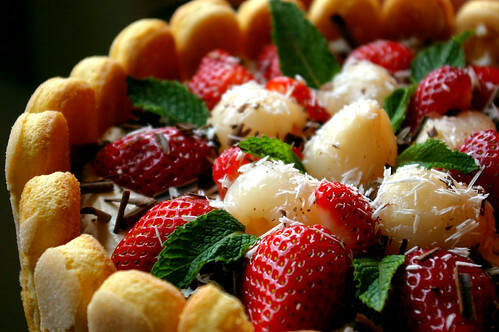 Her version of no-bake cheesecake even included my favorite tropical fruit- Lychee! Blessed is the one who think of adding lychee in the cheesecake filling. The person should be given some sort of baking creativity award. I went on to ask the lovely Ellena for the recipe, and was given a detailed instructions couple of days later. Don't you just love generous food blogger? Because my cheesecake came up a little too short, I took the liberty to add in another layer of Pierre Herme's Lemon Cream + whipped cream on top of the cream cheese filling. To further heighten the cake, I decorated the cake with some strawberries that I got from the farmer's market, together with the remaining lychee. For the lack of better decorating skill, I shaved some dark and white chocolate on top of the cake, and plucked some mint leaves to cover the spare space. The mint, which we later discovered, went well with the lychee cheesecake! An icy cold lychee cheesecake is indeed a fitting dessert on a hot summer night. The smoothness of the cream cheese with the hint of lemon in the background balanced the sweetness from the lychee. I also like that there was lychee flesh in every bites of the cheesecake. I could taste the succelent juice from the lychee when they bursted in the cavity. 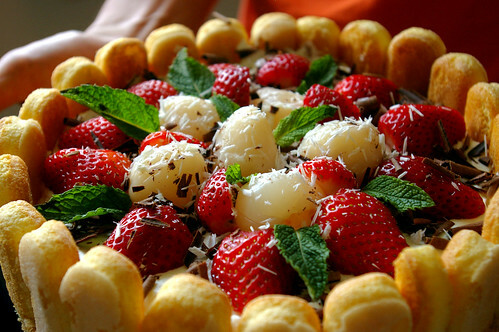 Because good thing is meant to be shared, I am submitting this Lychee Cheesecake for the SHF:Tropical Paradise hosted by a very talented baker-Mary. Lychee in the form of cold dessert is my ideal of Tropical Paradise. hi friends, I am still here. Still cooking but certainly bake less. I really feel guilty about not updating my blog for more than a week now! But my little brain doesn't work well under the sweltering heat. Can anyone think of a lamer excuse than this?! There are days when I don't feel like standing in front of the stove. And there are days when produce threaten to spoil if I decided to turn a blind eye. What would I do if both unfortunate situations coincide? 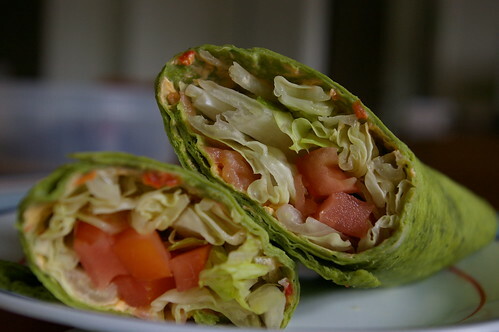 The last time I had some very ripe tomatoes and romaine, I added them in the filling of a wrap together with some smoked salmon. Spreaded with a thick layer of jalapeno cheese spread on a spinach tortilla, it was a perfect way to clear up some fridge space for our coming farmer's market find. Not to mention, a good way to use up the cheese spreads which we always unable to finish before they expire. 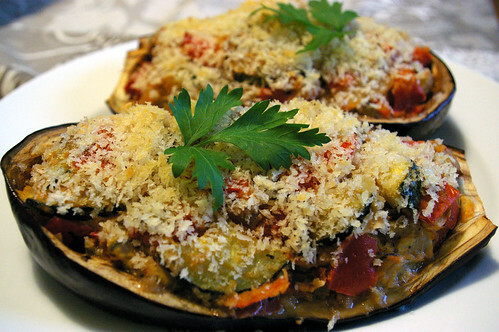 A simple meal that doesn't require much effort but sufficient to satisfy the husband who is always hungry. What do you do on days like these? What would you turn up in a 4th of July party if you are asked to bring a dessert? Not that I have such a request to fulfil, but I thought it would be fun to put myself in one's shoe. You know, in case we decide to throw a last minute party and need a fast idea on "what's for dessert". Dessert is always the most important element of parties we throw. It's the only thing that friends seem to remember. Of course, I have my total lack of creativity for exciting dishes to blame. But I am pretty happy to focus on my strength now. Which brings us to the dessert. Inspired by a tub of almost-expiring mascarpone cheese in the fridge, I decided to tackle a dessert that hasn't turned up on our household for a long time. Not because I dislike it, but simply because I couldn't find the right occasion to make it. The dessert, which I love so dearly and believe should only indulge on a super special occasion is none other than Tiramisu. Tiramisu, which loosely translated to "pick me up" is a very special dessert to me. It was the first dessert I made from scratch. 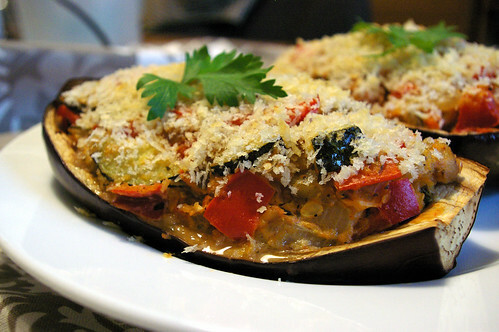 Of course, with the help of such quality ingredients, one could hardly mess this recipe up. 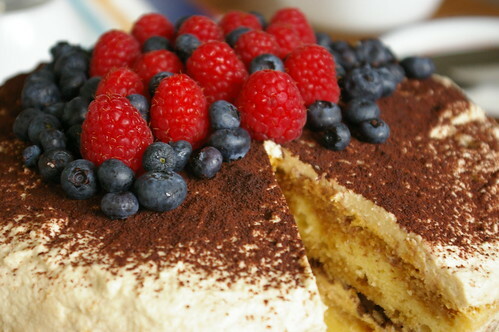 I remembered the first Tiramisu I made used lady fingers as base and incorporated egg yolks in the filling. 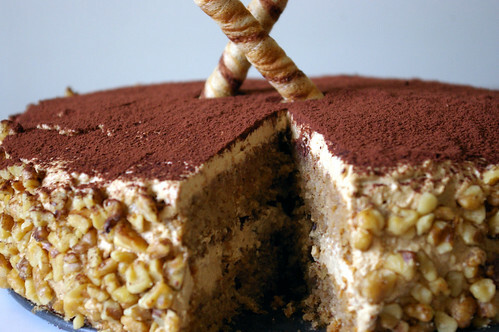 This Tiramisu however, is a cake version. And it has a cream base filling with no egg yolks involved. To be perfectly honest, this was not my recipe of choice when I set out to make Tiramisu. I had set my sight on one with genoise as base, but for some unfathomable reasons the genoise didn't turn out well. So I threw it away and switched to this recipe for a change of luck. Sheer serendipity that I chanced upon this recipe and decided to give it a shot. And it is the best Tiramisu I have ever tasted. In this recipe, the light yellow cakes are first drenched with boozed espresso syrup, then a layer of caffeinated heavenly mascarpone cream is liberally smothered on top, followed by handfuls of finely chopped bittersweet chocolate, which then topped with another layer of cake and cream. It is a decadent dessert without any need of description. But for a 4th July party, it needs to be dressed up for the occasion. The best answer to that would be some raspberries and blueberries on top of the cocoa dusting. Not only are the berries pleasing to the eyes, they are indeed delicious together. And this my friend, is what you can bring for a 4th of July party. Center a rack in the oven and preheat the oven to 350F. Butter two 9x2 inch round cake pans, dust the inside with flour, tap out the excess and line the bottoms of the pan with parchment or wax paper. Put the pans on baking sheet. a large bowl, beat the butter on medium speed until soft and creamy. Add the sugar and beat for another 3 minutes. Add the eggs, one by one, and then the yolk, beating for one minute after each addition. Beat in the vanilla; don't be concerned if the mixture looks curdled. Reduce the mixer speed to low and add the dry ingredients alernately with the buttermilk. adding the dry ingredients in 3 additions and the milk in 2 (begin and end with the dry ingredients); scrape down the sides of the bowl as needed and mix only until the ingredients disappear into the batter. Divide the batter evenly between the two pans and smooth the tops with a rubber spatula. Bake for 28 to 30 minutes,rotating the pans at the midway point. When fully baked, the cakes will be golden and springy to the touch and a thin knife inserted into the centers will come out clean. Transfer the cakes to a rack and cook for about 5 minutes, then run a knife around the sides of the cakes, unmold them and peel off the paper liners. Invert and cool to room temperature right side up. Put the mascarpone, sugar, vanilla and liqueur in a large bowl and whish just until blended and smooth. Working with the stand mixer with the whish attachment or with a hand mixer, whip the heavy cream until it holds form peaks. Switch to a rubber spatula and stir about one quarter of the whipped cream into the mascarpone. Fold in the rest of the whipped cream with a light touch. Add the remaining 1 to 1.5 tablespoon of espresso extract into the mascarpone cream. Taste to decided how much extract you want to add. If the tops of the cake layers have crowned, use a long serrated knife and a gentle sawing motion to even them. Place one layer right side up on a cardboard round or a cake plate protected with strips of wax or parchment paper. Using a pastry brush or a small spoon, soak the layer with about one third of the espresso syrup. Smooth some of the mascarpone cream over the layer- use about 1 1/4 cups- and gently press the chopped chocolate into the filling. Put the second cake later on the counter and soak the topof it with half the remaining espresso syrup, then turn the layer over and position it, soaked side down, over the filling. Soak the top of the cake with the remaining syrup. Use the remaining cream to frost the top of the cake. If the frosting looks as if it might be a little too soft to spread on the cake, press a piece of plastic wrap against its surface and refrigerate it for 15 minutes or so. Refrigerate the cake too. With a long metal icing spatula, smooth the frosting around the sides of the cake and over the top. Decorate with chocolate covered espresso beans or blueberries and raspberries for a 4th of July party. Refrigerate the cake for at least 3 hours (or up to one day) before serving, so that the elements have enough time to meld. Just before serving, dust the top of the cake with cocoa powder. Eventhough I am pretty sure I have found my favorite lemon cake recipe, but when there's a new one showing up in magazine and garnered the test kitchen's highest rating, I know I have to give it a try. And I want to try it now. Not to chuck it away in my ever-increasing "to-try-list". For the chance of forget-it-all is too high for this forgetful baker. Afterall, I find many reasons to support my case. Such as the imminent Friday treat, and the overripe cherries in the fridge. More imporantly, I need a confident boost after a failed attempt at genoise in the morning (more on that later). 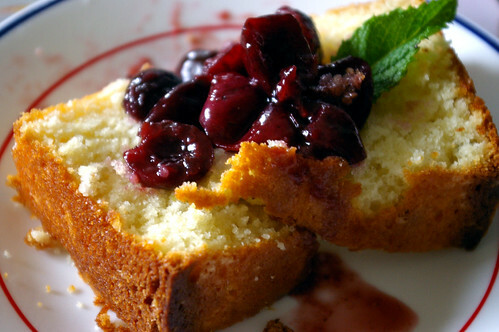 The pound cake is a fairly straightforward recipe, with the addition of an intriguing ingredient in the batter- chopped mint. I have certainly not thought of adding mint in lemon cake. In fact, it is hardly detectable in the cake. But there's a little something lingered on my tongue when I first bite into the cake which I can't put my finger to. I wonder if it's my imagination, since I know I have added mint to the batter. I shall try to omit mint the next time I bake this lemon cake. Yes, I am telling you that I will be baking this lemon cake again! 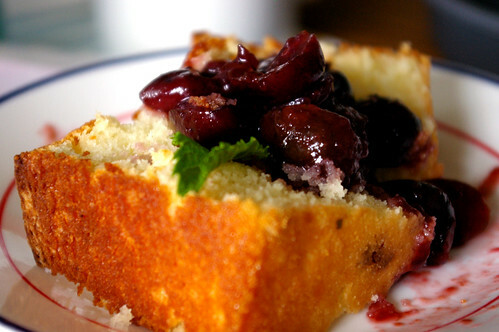 Because it is moist, tender, lemony and more importantly, has lower fat than my favorite lemon cake. It's pure joy when you step out of your comfort zone to try something new (and good for you), and find yourself loving it. Good things are meant to be shared. Other than with OCT's colleagues, I am going to submit this excellent recipe for ARF-5-A-Days. Check out the roundup on Tuesday night for more Anti-Oxidant-Rich ideas at Cate's blog. I hope all lemon lovers out there will give this recipe a try.